Robust polycarbonate homogeniser probes from Stuart are economical enough for single use but also quick and easy to clean and autoclavable. These 7 mm saw tooth probes can process 0.25-30 ml samples and are ideal for hard tissues such as heart, tumours, fatty tissue, muscle, kidney and lung, as well as all soft tissue applications. Compatibility with common reagent kits and with liquid nitrogen ensures complete versatility, while the clear two-piece construction eliminates sample loss. The new Stuart probes are designed to be disposed of after a single use to prevent cross contamination but may also be autoclaved up to seven times or cleaned, for example with 5% chlorine bleach or 70% alcohol. 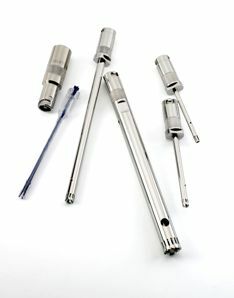 However, unlike traditional stainless steel probes which may take as long as 15 minutes to strip down and clean, the polycarbonate probe can be dismantled in seconds and without tools. Compatible with Stuart's lightweight SHM1 homogeniser and the more powerful SHM2 model, the polycarbonate probes are virtually unbreakable. Their processing capabilities are almost identical to those of stainless steel probes, except with the hardest sample types such as bone, cartilage and skin.